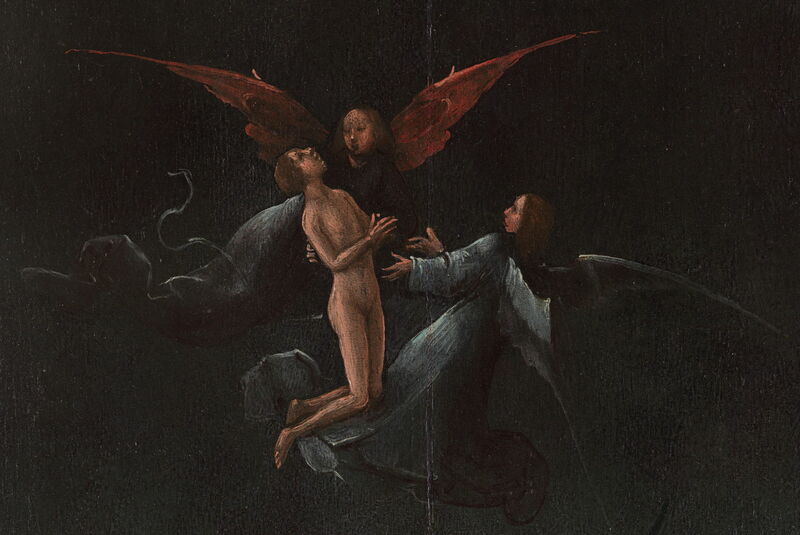 Hieronymus Bosch (c 1450–1516), Ascent of the Blessed (panel from Visions of the Hereafter) (detail) (1505-15), oil on oak panel, 88.8 x 39.9 cm, Museo di Palazzo Grimani, Venice. Photo Rik Klein Gotink and image processing Robert G. Erdmann for the Bosch Research and Conservation Project, via Wikimedia Commons. Four panels show with sublime simplicity the routes to Heaven and Hell. Their mystery is how they were configured, and whether there were other objects, such as a central carved panel, involved. These four panels consist of two pairs, showing in pictorially clear terms the routes to Heaven and Hell. The first pair, The Garden of Eden and The Ascent of the Blessed, show the route to Heaven for the pious and righteous. The other pair, The Fall of the Damned and The River to Hell, shows what awaits sinners. Uniquely among Bosch’s paintings, the pictorial content of these panels is simple and clear, and relatively free of Bosch’s freely-invented fantasy creatures. This gives them a simple beauty quite the opposite of paintings like The Garden of Earthly Delights. The exterior of these panels is painted in a very unusual way, in an even red or green, on which paint has then been dripped to give the appearance of marbled stones such as red porphyry and green serpentine marble. There is no evidence of any figures or other paintings on the exterior surfaces. Hieronymus Bosch (c 1450–1516), The Garden of Eden (panel from Visions of the Hereafter) (1505-15), oil on oak panel, 88.5 x 39.8 cm, Museo di Palazzo Grimani, Venice. Photo Rik Klein Gotink and image processing Robert G. Erdmann for the Bosch Research and Conservation Project, via Wikimedia Commons. The Garden of Eden shows a hilly deer park, with woods and meadows, dropping to flat mixed countryside with a river in the distance. Four distinct groups of naked figures are in the foreground, two of which have accompanying winged angels. Closest is a couple, seated on a hillside at the left and talking with an angel wearing a brown cloak. Slightly further away to the right is a larger group of ten human figures with an angel in a scarlet robe. They are all looking up to the left of the painting, and two are extending their arms in that direction. Hieronymus Bosch (c 1450–1516), The Garden of Eden (panel from Visions of the Hereafter) (detail) (1505-15), oil on oak panel, 88.5 x 39.8 cm, Museo di Palazzo Grimani, Venice. Photo Rik Klein Gotink and image processing Robert G. Erdmann for the Bosch Research and Conservation Project, via Wikimedia Commons. On the left, another group of seven humans, including a woman, are occupied with their own conversations and activities. A man has an exotic bird perched on his right forearm. Beyond them are four other humans, standing close together among the low trees. A small but steep hill rises to an ornate fountain tower with a high obelisk at its top. Several birds are perched on the tower, and a few animals are on the grass around it. Down in a valley to the right, a wolf is feeding on an animal carcass. In the distance the land is flat with woods and meadows, and a broad river which has been bridged. At the left, a hill rises and the ruins of a large castle are on the top. Hieronymus Bosch (c 1450–1516), The Ascent of the Blessed (panel from Visions of the Hereafter) (1505-15), oil on oak panel, 88.8 x 39.9 cm, Museo di Palazzo Grimani, Venice. Photo Rik Klein Gotink and image processing Robert G. Erdmann for the Bosch Research and Conservation Project, via Wikimedia Commons. The Ascent of the Blessed is set among the clouds, which rise in billows behind. Four naked humans are being brought by pairs of winged angels up towards a tunnel at the top of the panel. The lowermost group is at the bottom left corner of the panel, two angels either side of a man, who are looking up towards the right. Another trio is slightly higher up towards the right, and are also looking almost vertically upwards. The third group is near the centre of the panel, and includes an angel with bright red wings. Hieronymus Bosch (c 1450–1516), The Ascent of the Blessed (panel from Visions of the Hereafter) (detail) (1505-15), oil on oak panel, 88.8 x 39.9 cm, Museo di Palazzo Grimani, Venice. Photo Rik Klein Gotink and image processing Robert G. Erdmann for the Bosch Research and Conservation Project, via Wikimedia Commons. Just below the entrance to the tunnel is one human and a single angel, who are watching another human and angel making their way down the length of the tunnel. The tunnel is seen slightly obliquely, its far end brilliantly lit, silhouetting two people and an angel at the far end. 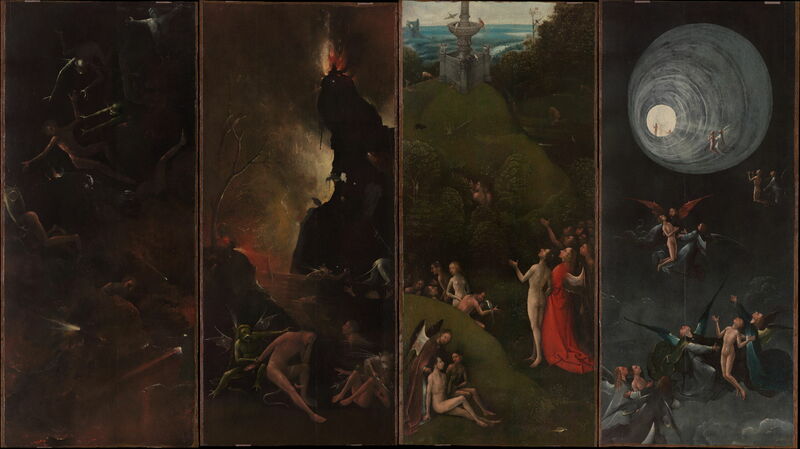 Hieronymus Bosch (c 1450–1516), The Fall of the Damned (panel from Visions of the Hereafter) (1505-15), oil on oak panel, 88.8 x 39.6 cm, Museo di Palazzo Grimani, Venice. Photo Rik Klein Gotink and image processing Robert G. Erdmann for the Bosch Research and Conservation Project, via Wikimedia Commons. The Fall of the Damned shows the descent of three naked humans through a dark chasm populated by several daemons. At the top right, a grey daemon is spreadeagle on a rock at the side of the chasm. 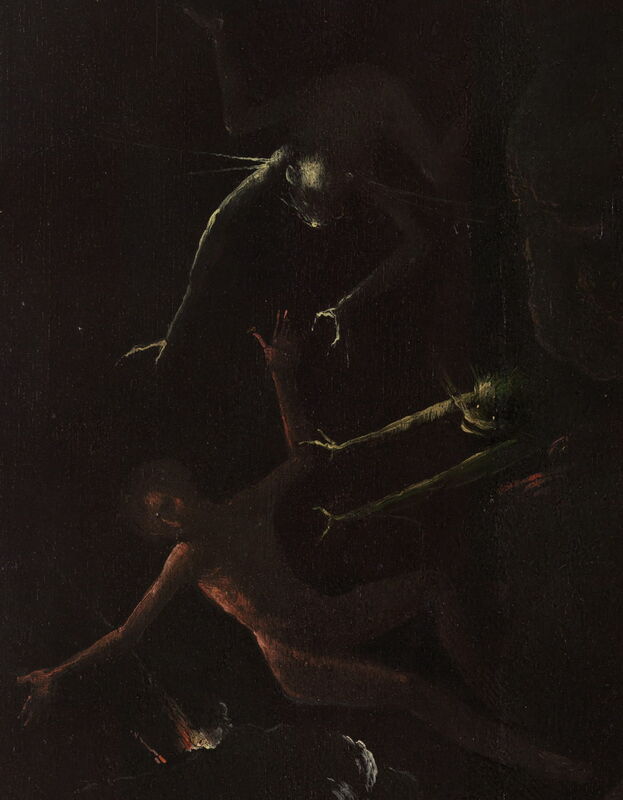 In the midline and below, a human is part-falling part-climbing down the side of the chasm, two greenish daemons pushing them from the side and down. Below them the boulders forming the chasm are lit in small patches suggesting small fires. 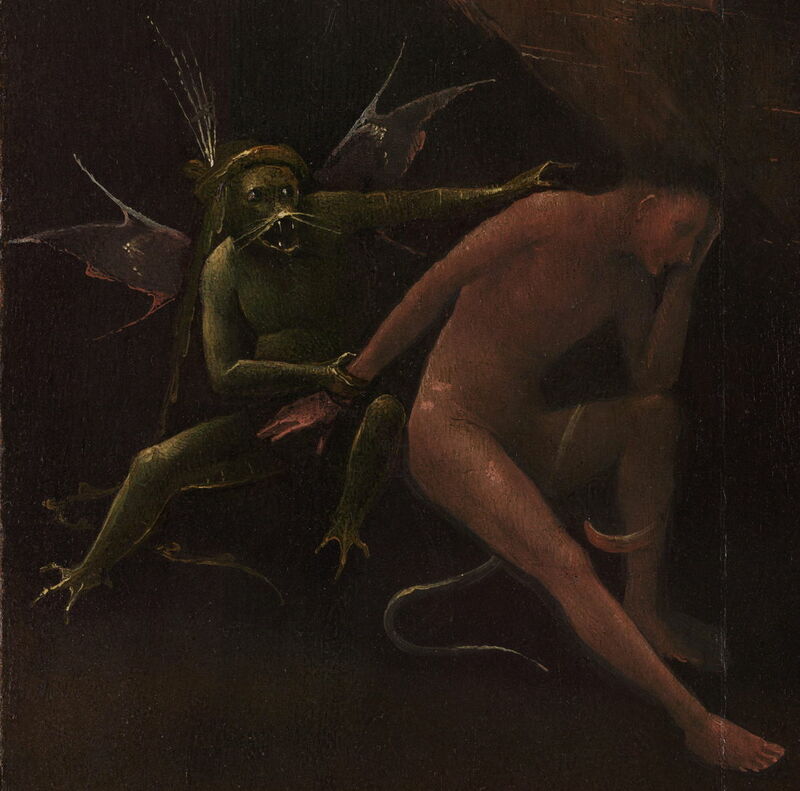 Hieronymus Bosch (c 1450–1516), The Fall of the Damned (panel from Visions of the Hereafter) (detail) (1505-15), oil on oak panel, 88.8 x 39.6 cm, Museo di Palazzo Grimani, Venice. Photo Rik Klein Gotink and image processing Robert G. Erdmann for the Bosch Research and Conservation Project, via Wikimedia Commons. Halfway down the left side of the panel, another human is being lifted by the pelvic region by a green daemon. A human is seen lower and just to the right of the centre, making their descent. Nearby are creatures emitting small shafts of light, as if searching for humans to move on down. At the foot of the panel, the chasm appears to open out, with the red of fire glinting on its rocks. Hieronymus Bosch (c 1450–1516), The River to Hell (panel from Visions of the Hereafter) (1505-15), oil on oak panel, 88.8 x 39.6 cm, Museo di Palazzo Grimani, Venice. Photo Rik Klein Gotink and image processing Robert G. Erdmann for the Bosch Research and Conservation Project, via Wikimedia Commons. In The River to Hell six naked humans are in torment in or near a river, whose surface is angled bizarrely down to the right. In the foreground, a green winged daemon is making a man who has got out of the river get back into it. Behind four other men are trying to swim in the river, one with their hands raised in distress, another seen only by their single raised arm. At the far side, on the right, two daemons are in the river too. Above the water there are red patches indicative of fire, the bare remains of a tree on which a single bird is perched, and a towering rock pinnacle. Part way up that another bird is perched and seen only in silhouette. There is also the ghostly figure of an owl. On top of the pinnacle there are more daemons and fire, shooting sparks upwards. There are further bright lights behind the pinnacle, which help make its form clear. 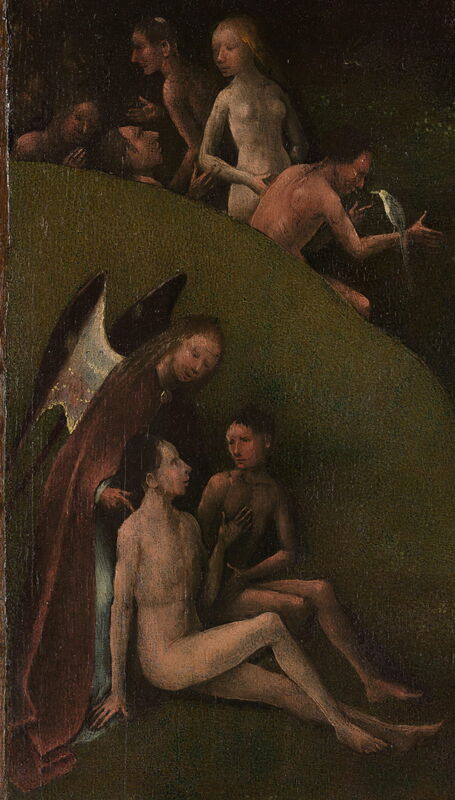 These panels are not only unique among Bosch’s surviving works for their elegant simplicity in content, but Ilsink et al. point out that they were painted in a most unusual manner, which accounts for their distinctive appearance. Bosch apparently laid an even layer of black immediately on top of the ground, and painted on top of that. The hereafter offered to the viewer is not the elaborate system of purgatory and levels of Dante Alighieri’s Divine Comedy, but a simple northern European dichotomy: up or down. Their depiction in the four panels is a little less obvious than might at first appear. The matching panels are The Ascent of the Blessed and The Fall of the Damned, which show the initial transit from earth. The River to Hell then shows the next destination for those unfortunate enough to be doomed to eternal suffering, which might suggest that The Garden of Eden is its equivalent for those destined for Heaven. Although that sequence cannot be ruled out completely, it does not match the pictorial content. The large group on the right of The Garden of Eden is clearly observing something high up to the left of that panel. Therefore, unless there is a missing panel in the series, The Ascent of the Blessed shows the next stage in their progress to Heaven, and is positioned on the left of The Garden of Eden. Placement of the two panels showing the route to Hell then depends on whether they are positioned below those for Heaven, or to one side of them. If below, The River to Hell should go on the left, below The Ascent of the Blessed, to preserve the reading sense. If all four panels were to be placed in a single row, then the Hell panels could be placed in either order according to the reading intention. Their most remarkable feature is the tunnel at the top of The Ascent of the Blessed. Circular structures like that tunnel were almost unseen until the Industrial Revolution enabled the production of sheet metal. In Bosch’s day, the only way that a circular tunnel could have been constructed would have been using a large number of planks, as in a barrel, which would have given it a completely different appearance. It is not clear what Bosch may have modelled this tunnel on, and it appears uniquely inventive on his part. Despite the uncharacteristic content and unusual painting technique of these four panels, they are well attested in documentary evidence which suggests that they may have been seen in the Venetian home of Cardinal Domenico Grimani in 1521. It has in the past been disputed that they were painted by Bosch, but that question now seems fairly settled. Their precise arrangement and purpose remains a matter of discussion. Matthijs Ilsink, Jos Koldeweij et al. (2016) pp 308-315 in Hieronymus Bosch, Painter and Draughtsman: Catalogue Raisonné, Yale UP and Mercatorfonds. ISBN 978 0 300 22014 8. Posted in General, Painting and tagged Alighieri, Bosch, Dante, painting. Bookmark the permalink.